This program of French masterworks was designed to showcase all the colors and nuances of this outstanding new instrument. It includes the world premiere recording of an important piece by beloved composer Florent Schmitt: Prière (Prelude in G minor), Op.11 (1899). Gorgeous HDCD sonics by Grammy-winning engineer Keith Johnson will thrill organ music lovers and audiophiles of all persuasions, especially those with powerful subwoofers! 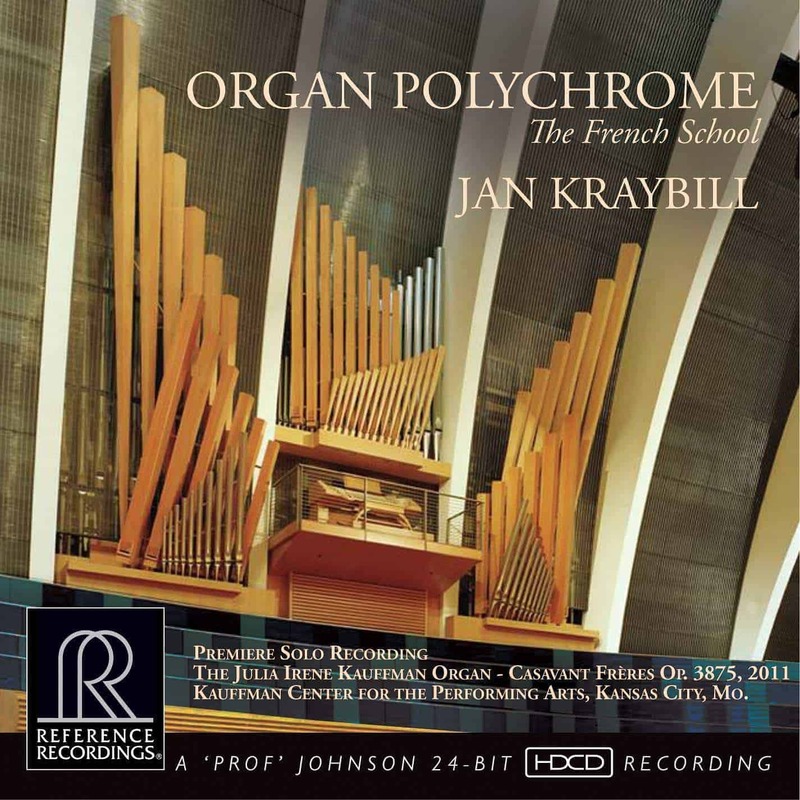 Reference Recordings is proud to offer these brilliant performances by the organist who knows this instrument best, Jan Kraybill. She regularly plays and oversees the care of the three largest pipe organs in the Kansas City metro area: the Community of Christ Auditorium’s 113-rank Aeolian-Skinner (installed in 1959) and Temple’s 102-rank Casavant (1993), and the 102-rank Julia Irene Kauffman Casavant (2011) at the Kauffman Center’s Helzberg Hall. At the Kauffman Center, she performs and hosts guest organists in both solo and collaborative musical events, including regular appearances with a major tenant of the Center, the Kansas City Symphony and Chorus. As a junior in high school in Colby, Kansas, Jan Kraybill performed her first European piano recital in Andover, England. She earned education and piano performance degrees from Kansas State University in Manhattan, Kansas, and her doctorate in organ performance is from the Conservatory of Music and Dance at the University of Missouri-Kansas City. In 2010 she earned the Fellow certificate from the American Guild of Organists, the highest certification available for organists. Dr. Kraybill maintains an active concert career, having appeared as a soloist and collaborative artist throughout the United States and in Canada, Germany, Great Britain, Poland, Russia, South Korea, and Tahiti; she has been featured at regional and national convéentions of the AGO and other musicians’ organizations. She has recorded three solo CDs on Community of Christ’s instruments, and this disc is the first on the Julia Irene Kauffman Casavant. SCHMITT: Prière (Prelude in G minor), Op.11 – World premiere!